We returned to Bangkok for a few days visiting a friend from Cuenca who is working here for seven months. 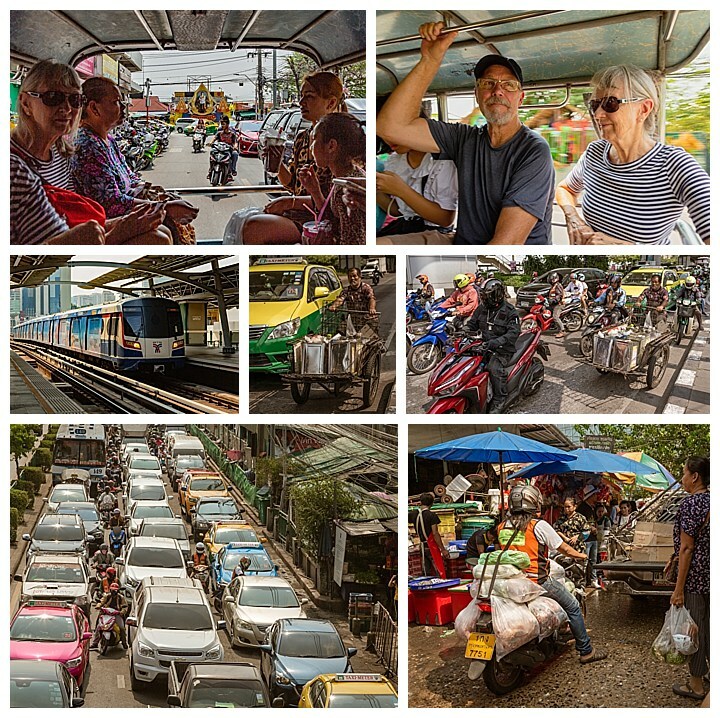 We visited another floating market, Bang Nanpheung, and had to take quite a circuitous route to get there, using multiple transportation services. Later, through the kindness of strangers helping give us directions, we returned home, first on the back of a pick up truck, then a local bus, crossed the river on a local ferry, the sky train to the Nana station, and and finally walking the rest of the way home. 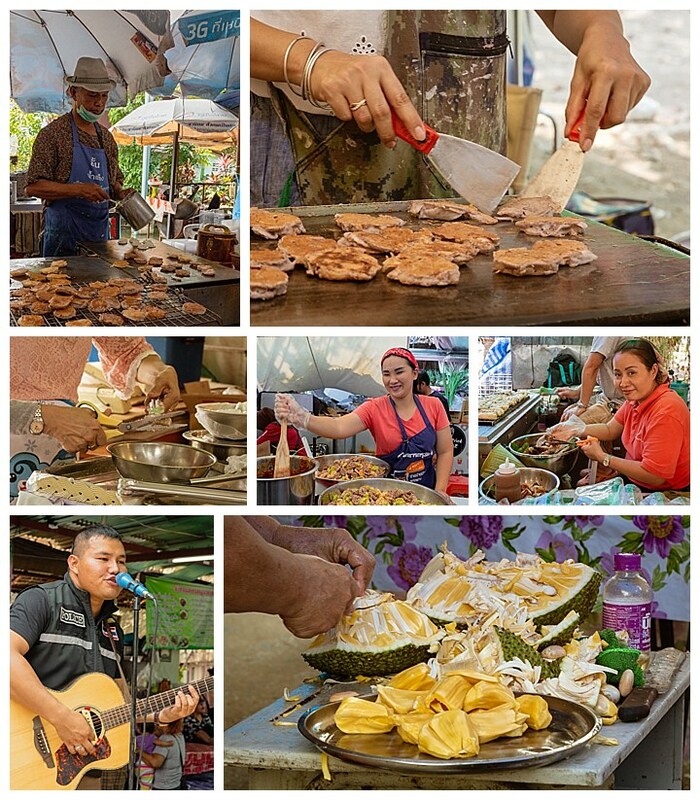 This time at the floating market, we even saw a woman preparing durian fruit (lower-right) — that awful smelling stuff that is banned from airplanes, and even some hotels. By the time we saw her, we had already eaten… and I wasn’t sure I really wanted to develop a taste for something that was forbidden in all closed spaces anyway…! The next morning, at the recommendation of our friend, we joined a cooking class, Cooking with Poo. We began with a visit to the hectic Klongteau wholesale market to buy some of the ingredients for the class. Most buyers here were with restaurants. 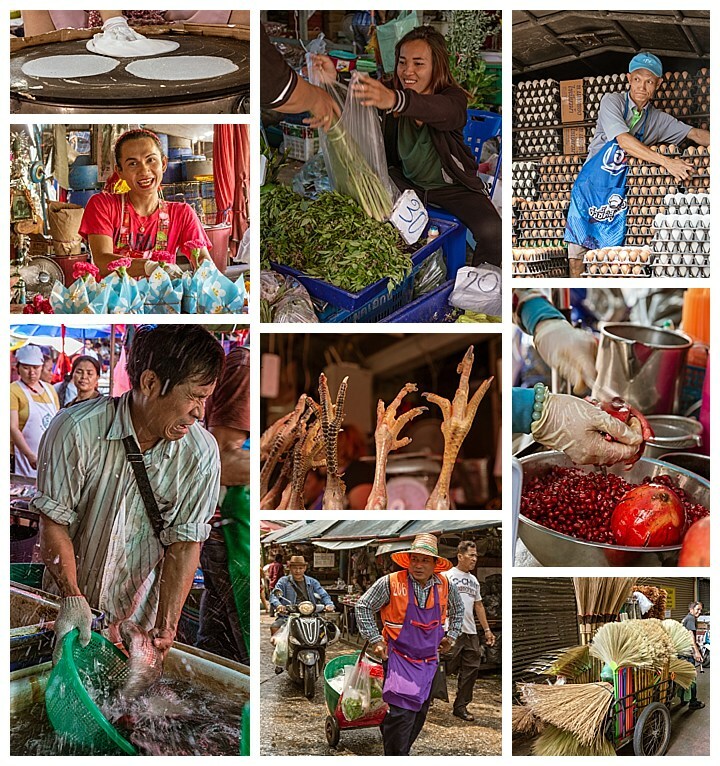 There were many fresh fish vendors, which resulted in the humorous lower-left image where one vendor was picking them out for a buyer, when the fish started flopping and splashing him. The woman top-left was making some kind of crepe in a way we have never seen before. She would stick her hand into a tub, and come out with a large handful of dough. She then quickly swabbed it in a roughly 12″ circle on the hot pan, just letting what stuck stay there before moving to a new spot and doing it again. This was repeated three times, for the pattern shown above. The crepes were allowed to cook about 5 seconds, and then scrapped off quickly and tossed to her partner, who stacked them into bags. Very fast and efficient. Unfortunately, we saw this while being rushed through the market by the buyer for the cooking class, so were not able to buy one to try. The class was “Cooking With Poo,” and was another highly efficient machine designed to move as many students through as quickly and as uniformly as possible. Walking to the cooking school provided a view into a local neighborhood with its narrow alleys. Apparently, Poo provides a lot of help to her community by creating jobs, selling product and providing hope. 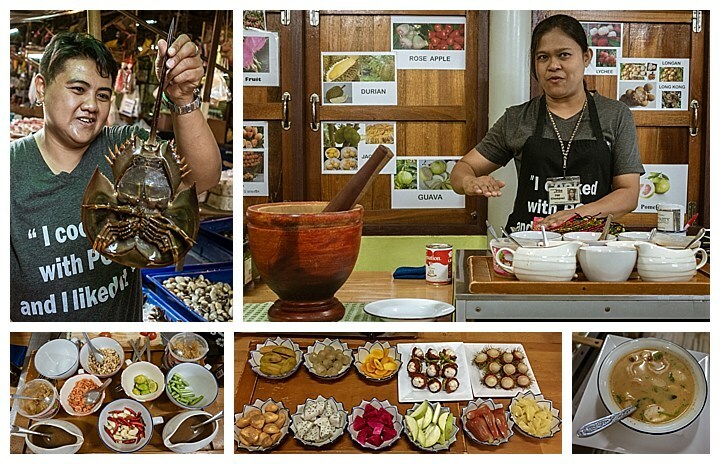 We were introduced to taste a lot of local fruits as our dessert (bottom-center). The next stop was at the Erawan museum. It is well known for its massive 3-headed elephant sculpture on top of their building (top-left), and the three storys inside contain antiquities and priceless collections of ancient religious objects. It is election time here in Thailand. Every major street was lined with the same campaign postures over and over, and loudspeaker trucks roams the streets blaring out their candidates message from dawn till dusk. Interestingly, the parties each get a number, just as they do in Ecuador. That makes it easier to be able to tell who they wish to vote for, for those who are unable to read. However, in Ecuador, the parties have a single number throughout the country. Doesn’t matter what city you are in or what year you are voting, party #35 is always the Pais Party (the party currently in power). 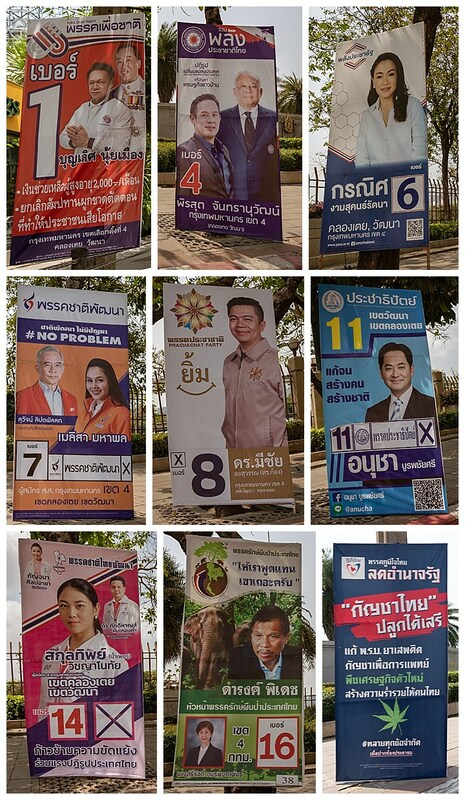 In Thailand though, a new number is assigned every party in every city for every election cycle, and often in every borough (as in Bangkok). Thus, the party with #1 in downtown Bangkok is #9 in Sukhothai, and #6 in Chiang Mai. One constant in Bangkok is traffic congestion. It was common to be in a taxi and make fabulous progress for a few miles, then suddenly come to a nearly complete stop, with the next two blocks requiring a full half hour. This happened two days in a row in the same place, when returning to our friend’s home. We were always cautioned when scheduling any trip involving driving, to leave an extra hour, since you never knew when that would hit you. 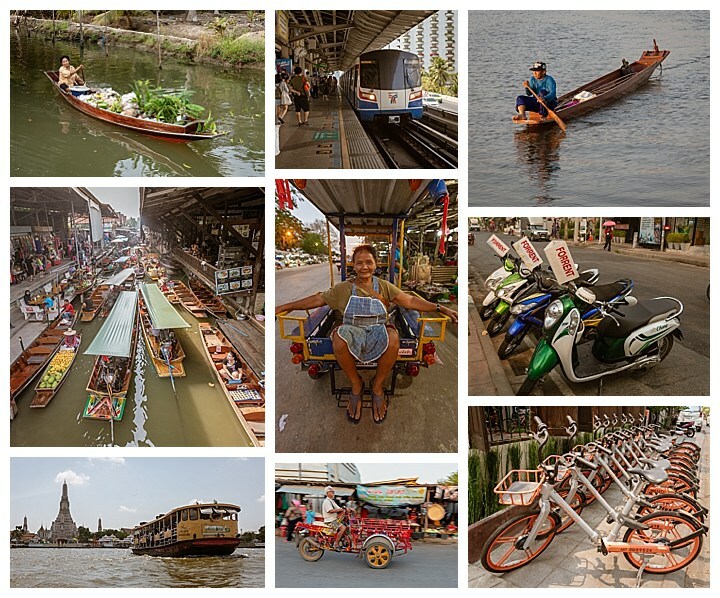 There are a myriad of ways to get around Bangkok using public transportation. People around the floating markets use mostly boats, as can be expected. 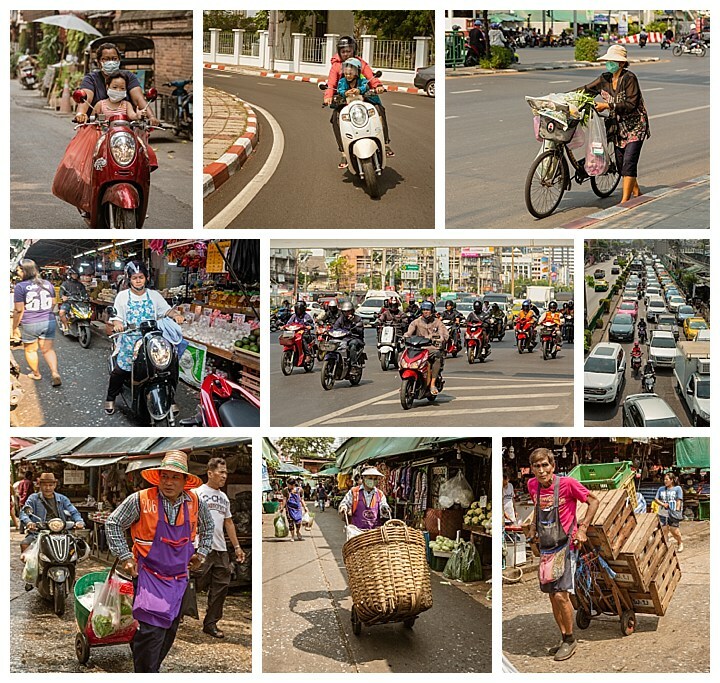 Then there are ferries (lower-left), rental motor scooters (center-right), rental bicycles that you can drop off anywhere on any corner (lower-right), tuk-tuks (middle), pedal driven carts (bottom-center), and even a modern light rail that speeds by the traffic below (top-center). It is common for small children to ride in a special mini-seat up front in scooters (top-left and top-center). Scooters are also used in the markets, driving right through the crowded pedestrian areas (left-center). Traffic is often so dense (middle-right) that motor scooters crowd to the front to get past the cars and make some headway (center). In the wholesale market, many people use heavy handcarts to haul the food they purchase for their restaurants. Our last night in Bangkok there was a “Super Moon.” I was able to capture this skyline scene from the balcony of our friend’s apartment. How to wrap up Thailand and Bangkok? 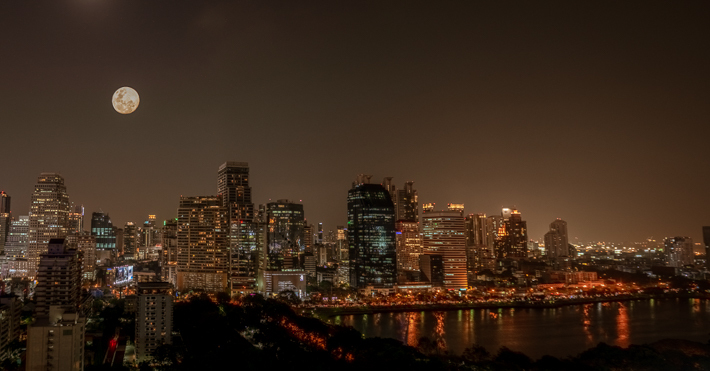 How about learning how to properly say Bangkok in the Thai language? Listen to Wi (our Thai guide through most of this trip) say it properly. The clip is only 30 seconds… but then it takes almost that long to say the name!